The Daiwa Saltist-LD Hyper-Speed Lever Drag Saltwater Reel boasts a blazing fast 7.3:1 or 7.1:1 gear ratio that could provoke an aggressive jig strike from quick moving predators. If you're pursuing wahoo or yellowtail, you'll certainly appreciate this Saltist-LD reel's speedy capabilities. The added retrieval speed will come in handy when you're working deepwater jigs, too. ""Fished Sunday 24 oxnard ca. boat Sea Jay.Caught a200to250lp Black Sea Bass. Played for 45min brought to leader then released. Daiwa Saltist held up well.Wish i had two more." "My only disappointment was the lack of cranking power. The high speed is what caught my attention for deep water fishing (cod,pollock,and haddock). 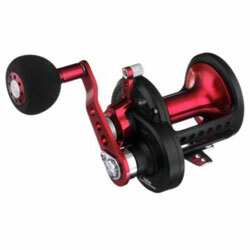 In talking with a rep from Daiwa he recommended the 6.3 ratio model or the 35 hyper model for more cranking power."